I love a sparkling clean kitchen. It has the ability to make me happy in a way few other things can. Unfortunately, unless I kick my husband and children out of the house and stop eating completely, it is only perfectly clean for a few minutes. A dirty kitchen stresses me out and makes me very, very unhappy. There is nothing worse than coming home from a long day at work and seeing a sink piled with dishes, junk all over the counters, crumbs all over the floor, and the cheese left out to dry (can you tell my children just finished with spring break?). And I simply don't have time to be cleaning it constantly with three busy children, a job, and a very "overstuffed" schedule of my own. So, I have a few tricks up my sleeve to keep the kitchen pretty clean, despite the fact that cleaning usually ends up being dead last on my priority list because I'm too busy playing chauffeur and grading papers. When I actually take the time--and it's minimal--to do these things, I'm so much happier! In other words, if you dirty a dish, clean it immediately, or at least put it into the dishwasher. I don't actually have a dishwasher, so in order to follow this rule, I have to take an extra minute or two after eating lunch to wash my plate and utensils. Or, if I'm baking cookies, I will need to take an extra five minutes to wash the measuring cups and spoons, the mixing bowls, and the cookie sheet once they are finished. Sometimes it feels like it's too much to even do that, but trust me, a few plates and utensils have a way of piling up and overtaking your kitchen sink alarmingly fast. 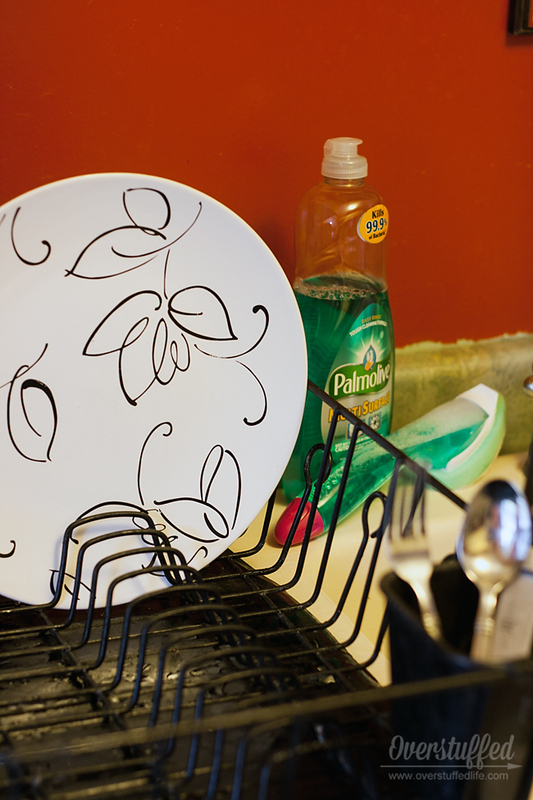 A few extra minutes now is much easier than a couple hours later (especially if you don't have a dishwasher!). Obviously, big meals make this a little bit more difficult, as a large amount of dishes are dirtied quickly. Make it a habit to clean as many dishes as you can during your meal prep, and then do all other dishes as soon as dinner is done. This is where we always get behind in my house. If there is something going on right after dinner and it makes it too hard to do the dishes immediately after eating make a commitment that you will do them first thing upon coming home. If even that is too hard, maybe using paper plates on the crazy evenings is the best idea. Teach every member of your household this one rule, and it will be even easier. I'm still working on my children, but we're getting there. Nothing is worse than spending ten minutes trying to scrub dried spaghetti sauce off of the counter when it would have only taken one second to do it right when it happened. We all spill stuff while we're preparing meals, and I have completely given up on being able to open a can without getting some of its contents on the counter. The difference is taking the one second--ONE SECOND--to wipe it all up as soon as it happens. It goes without saying, but teach your kids to do the same. I'm pretty sure most of the messes I spend my life scrubbing clean were put there by my offspring. I don't know about you, but I have extremely limited counter space. Something had better be used on a daily basis in order to earn a permanent spot on my counter. The three appliances that are left out are the KitchenAid, the toaster, and my blender—but even the blender gets put away during the winter when it isn't used as often. I've even moved several things down to the basement because they are used so little. Things that are used often, but not daily, are moved either to the top of the cabinets or put in a cupboard. Other clutter that tends to gather in kitchens like mail, school papers, keys, etc. should be given a designated spot that keeps it out of the way. Junk drawers are great, too, as long as you organize them every so often and don't let them become truly "junky." Whatever system you devise to take care of the clutter--stick to it. Follow up with your family often so that they learn to stick to it as well. Don't do it for them! While I don't have a lot of time, I do have some time. And so do you. Use the time you have wisely and set a timer. If we haven't been so great at keeping up with the first rule, I often set a timer for 15 or 30 minutes and do the dishes for that long. If I have been keeping up with the first rule, I set my timer and work on a deeper cleaning job like mopping or cleaning out a cupboard. Something about racing against the timer and knowing that I only have to do the job until it goes off makes me work faster and more efficiently. It always makes me feel better to use my 15 minutes of extra time being productive than it does when I choose to waste it away checking Facebook. Not to say that I don't ever choose to waste the time, because I do. I'm just a lot happier when I don't. I don't recommend using your phone as a timer—it's just plain too distracting. Instead, I use this timer which is cute, fun, and easy to use. To purchase click here: Cube Timer. There is nothing worse than having to rifle through your cleaning supplies to find 6 different things to use to get your kitchen clean—especially when you only have a few minutes anyway. 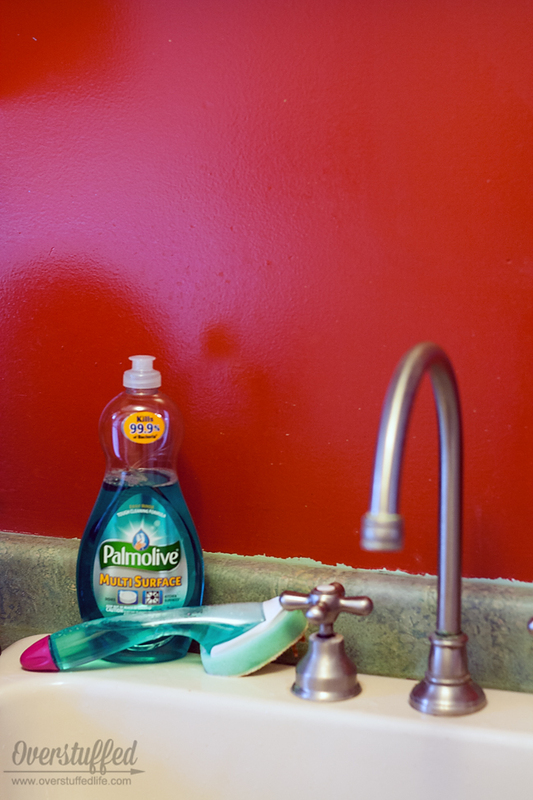 That's why I love to use cleaning products that work for multiple surfaces like the new Palmolive® Multi Surface. It's dish soap, so I can use it to clean all my dishes in my dishwasher-less kitchen. But it is also a multipurpose cleaner, so I can use the same sponge to also clean the counters (and scrub those dried-up spilled left by my kids), the floors, and even to wipe down appliances. It also kills 99.9% of bacteria (*staphylococcus aureus, Salmonella enterica and E. coli ((157:H7)) from dishes and hard non porous kitchen surfaces, so even though I have little time to really deep clean my kitchen, I can rest assured that the germs are gone. 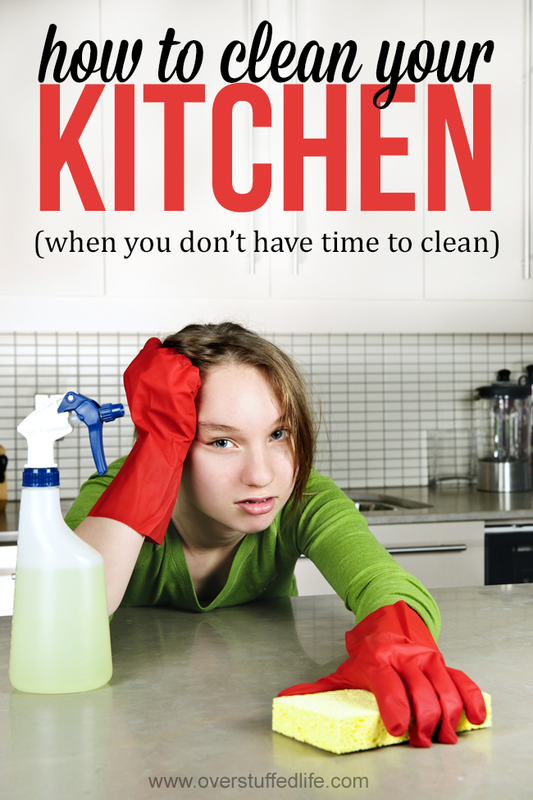 What's your best tip for keeping your kitchen clean when you're out of time? Setting a timer is my secret to getting ANYTHING done! Everything seems much more manageable and a lot of things begin to feel like a game--can I beat the clock? I LOVE setting a timer, I also like breaking things up throughout the day/week! Great post as always! Thanks for your nice blog! International record out now. dave. We’re selling International music record. oh my goodness, the timer idea is genius! Wiping up spills right away makes a huge difference for me- especially spills on the stove! Great tips. :) Cleaning the dishes before they pile up .... sigh. That's something I should do more! Wiping up the spills right away, makes it so much easier to clean up! Exactly. And knowing that I'm allowed to stop, even if I'm not finished really helps me to be motivated to do it, because sometimes things look too overwhelming. Then I'm surprised when I do it in less time than I thought it would take! It's my biggest cleaning trick and almost the only way I am motivated to do it, LOL! Yes. Now if I could only teach my children the magic that is cleaning spills immediately. Ha ha. These are tips I KNOW, but don't always actually DO. They do work, though! Amen! I'm really working on my children with this one. I went into the kitchen today and had some lovely breakfast spills to wipe up that nobody bothered with. A mother's work is never done! I know. Not really obvious in my home, either. Ha ha! I know, right! I'm working on it! I do wish I had a dishwasher. This would be much easier. But not having one makes me work harder at keeping up with the dishes, so that's good. The feeling of a time limit helps me a lot. It makes me more motivated to just get it done--all about the psychology!